In the 18th-century English poem The Rime of the Ancient Mariner, a storm drives a sailor’s ship toward the South Pole, where he encounters all manner of fantastical sights, including floating icebergs “as green as emerald.” It may sound like author Samuel Coleridge was taking some poetic license, but emerald-coloured icebergs are a real thing—and more than 200 years after that ballad was inked, scientists might know what causes them. A study published recently in the Journal of Geophysical Research: Oceans revisits the longstanding mystery of green icebergs, which sea captains have been reporting for nearly a century if not longer. While early work by the same authors suggested green icebergs got their coloration from carbon, new data made them revise their thinking. Now, they suspect that iron-oxide minerals are responsible for dyeing the ‘bergs to look like they’re ready for a St. Patrick’s Day party. If true, these iron-rich bergs could represent an important source of a crucial nutrient for the vast Southern Ocean encircling Antarctica. 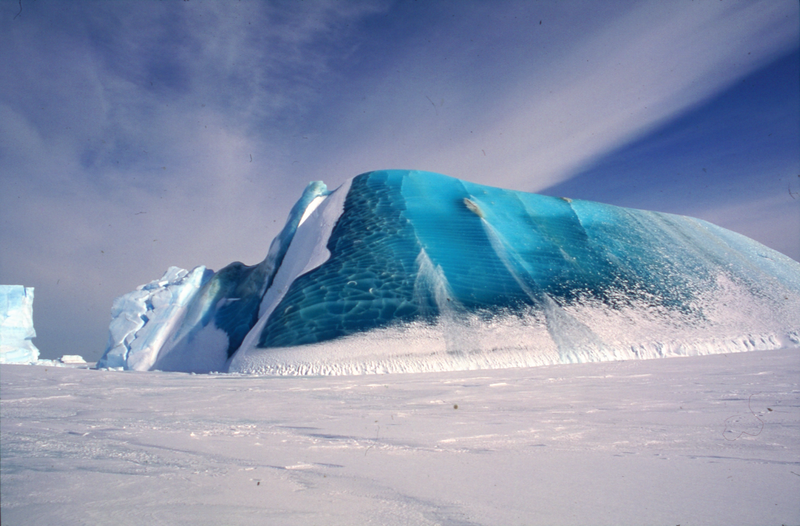 Warren’s experience with green icebergs dates back to 1988, when he joined an Australian expedition to Antarctica as part of his first sabbatical. By “lucky chance” when the crew reached Mawson research station on the west side of East Antarctica’s Amery Ice Shelf, they docked right near a rather striking iceberg that had become trapped in sea ice. The iceberg, Warren explained, was jade green and remarkably clear. Its clarity told the researchers they were dealing with marine ice, or ice that forms from seawater freezing at the bottom of a floating ice shelf. While the glacial ice that forms over land through the compaction of snow is opaque thanks to the presence of countless air pockets, marine ice does not contain light-reflecting air bubbles, making it see-through. Typically, marine ice takes on a deep blue colour, reflecting the distance photons of light have to travel before getting absorbed. Clearly, there was something else present in this jade-coloured ‘berg. Samples of the iceberg were collected, analysed in the lab, and found to contain dissolved organic matter (DOM), which can produce green and yellow colours along coastlines as rivers dump tiny bits of organic material into the sea. And so the researchers hypothesised that DOM was responsible. But in 1996, a new wrinkle to that story emerged, when Warren returned to a different part of the Amery Ice Shelf for his second sabbatical, and once again found himself confronted with a glacier of unusual hue. This one was a chimera of blue, green, and yellow-green marine ice glommed on to white glacial ice. When the ‘berg was analysed for DOM, both the green and blue ice were found to contain similar levels, suggesting something else was responsible for the colour difference. “It was a nagging concern we didn’t know what to do about, until two years ago, a paper came out of Tasmania showing large amounts of iron” in marine ice collected from the bottom of a drill hole, Warren explained. Warren and his colleagues now hypothesise that iron-oxide minerals are the culprit behind the green icebergs they’ve encountered. If true, those iron-bearing minerals are likely the result of “glacial flour,” basically dust formed by the erosion of bedrock. Scripps Institution of Oceanography glaciologist Helen Amanda Fricker, who studied the Amery Ice Shelf’s marine ice layer as part of her PhD work and has encountered emerald ‘bergs herself, said that the new paper offered a “possible, plausible mechanism” for their coloration. Still, more research is needed to be sure these giant ice popsicles are iron-flavoured. Warren said he and his colleagues submitted a proposal to travel back to the Amery Ice Shelf in search of more jade ‘bergs next spring. He’s hopeful their potential value—as a sort of dietary supplement supporting the Southern Ocean’s food chain—helps the group secure a grant. After all, if that hunch is correct, a climate change-induced shift in the number of green icebergs out there could have far-reaching consequences. “The reason we might get funding [is], they might actually be important,” Warren said.